Enjoy personalized attention and a flexible itinerary on this full-day private tour of Montevideo. 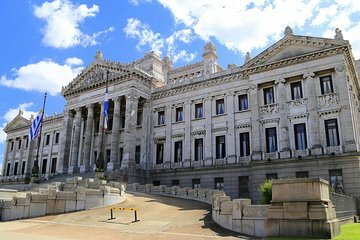 Travel from Buenos Aires via ferry to see all of the Uraguayan capital's important sights, stopping for an included lunch. Round-trip transport from Buenos Aires hotels included. Complete name and date of birthday is required too. The guide was terrific. very good. Walking and driving in Montevideo was great. This part could be longer we had enough time to see it better. and to keep walking around. The food was just bad. Bad in the sense of there was nothing like a piece of good meat. It was a buffet with a lot of cheap small bites.The bus trip afterwards was not worth it. We could just take the ferry back to Buenos Aires from Montevideo itself. The bus trip was too long, it was dark already to see anything from the bus so it was just sitting in the bus and driving to the station of the ferry. This was a 2 hour trip not worth it. And after that another 1 hour on the ferry to Buenos Aires.